There have been many different kinds of iPods. The latest is the iPod Touch. 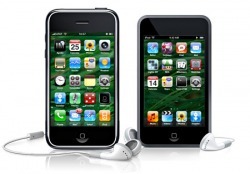 An iPod is a portable music device made by Apple. They first launched on October 23rd 2001. Apple thought portable music players were big and chunky so they decided to make their own. It took less than a year to make the first version. It was announced as a Mac compatible product with 5 GB memory that put 1,000 songs in your pocket.